For more than 40 years, over 8,600 dedicated nurses have chosen to certify in wound, ostomy, continence and foot care nursing through the WOCNCB. 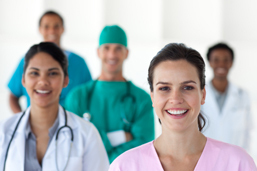 Certification provides validation of specialized knowledge, skills and expertise of an experienced nurse. The WOCNCB adheres to strict standards of quality and is a nationally certified organization. The WOCNCB's certifications meet the accreditation standards of the National Commission for Certifying Agencies (NCCA) and the Accreditation Board for Specialty Nursing Certification (ABSNC). The WOCNCB certification protects the public from unsafe and incompetent providers, provides consumers more options when choosing health care providers, and distinguishes the healthcare facility and administrators by providing expertise in wound, ostomy, continence and foot care. Is the credentialing organization accredited by an independent, national certifying body? Was a job analysis or role delineation study performed? Is the examination created by an individual or a committee of content experts? Does the certifying organization’s mission agree with the mission of your work environment? Does the certifying organization require that the coursework be completed by an outside, accredited program focusing on wound, ostomy and/or continence?